Long before the adventures of John Rolfe and Pocahontas, Spanish ships reached Virginia's shore. In the centuries that followed, Hispanics and Latinos settled in Virginia to seek new opportunities away from home. The 1980s saw the beginnings of el Nuevo Sur, or the New South, as Virginia's Latin American population surged. Since then, the now-defunct Virginia Center for Latin American Art briefly showcased Virginia's Latino and Hispanic evolving arts heritage. Restaurants like Pollo Campero and La Tasca have joined the local culinary scene, and schools and churches have forged plans for their changing communities. 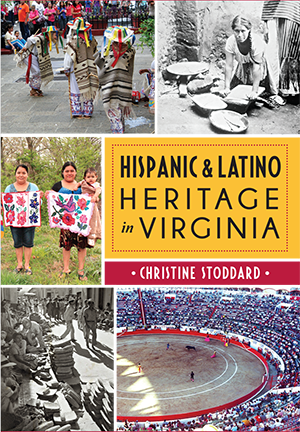 Join author Christine Stoddard as she traces the vibrant history and culture of Hispanics and Latinos in Virginia. Christine Stoddard is a writer, artist and AmeriCorps alumna originally from Arlington, Virginia. In 2014, Folio magazine named her one of the country's top twenty media visionaries in their twenties for founding Quail Bell magazine and other projects under the Quail Bell Press & Productions umbrella. Christine's work has appeared in Cosmopolitan, Tulane Review, the New York Transit Museum and beyond. Her endeavors have been recognized by Time Out New York, BinderCon NYC, the Washington Post Express, Style Weekly, the Puffin Foundation, the Newseum Institute and other organizations. Previously, she co-authored the Arcadia Publishing title Images of America: Richmond Cemeteries.